Marine Bagneris (MAP) et Frédéric Lebon (LMA). 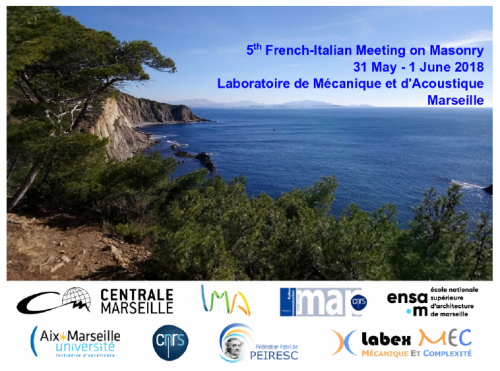 The main aim of this meeting is to exchange new ideas and show the state of the art of different research groups active in France and Italy, two countries at the top of the world for the research on masonry. A Scopus enquire with keyword “masonry” ordered by country shows 1609 records for Italy and 274 for France, with a percentage contribution respectively of 12.5% and 2.1% on the global scientific production, putting thus in evidence the importance of a tight interaction between French and Italian research groups.